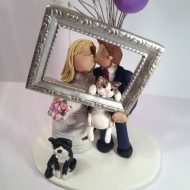 Even the family pet rabbits made it onto this wedding cake topper! 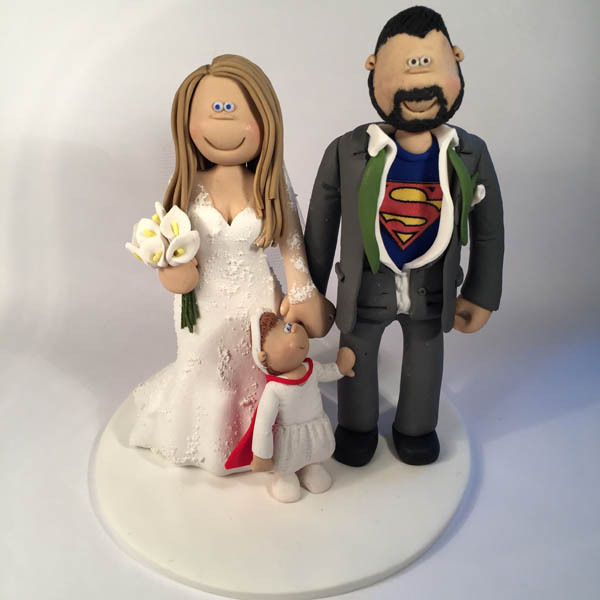 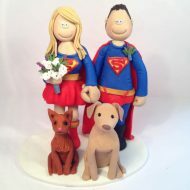 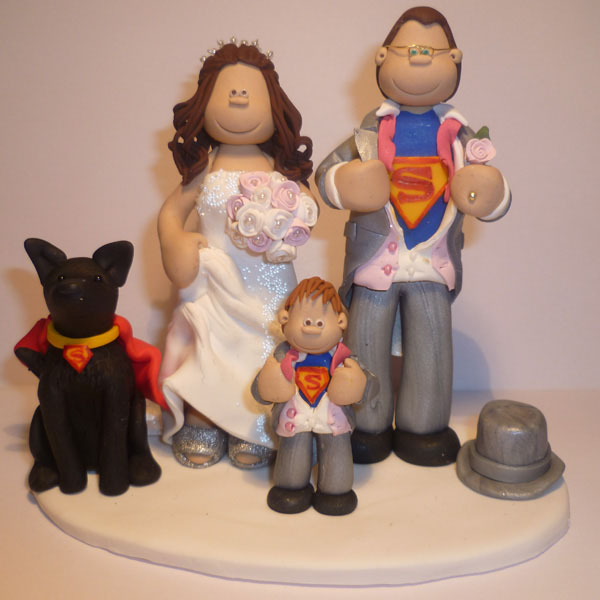 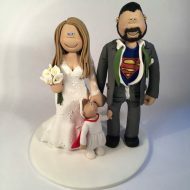 A cute little cake topper with a baby superhero and her superhero dad! 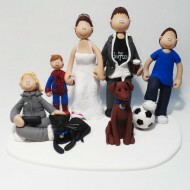 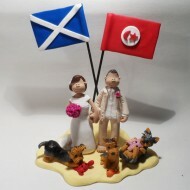 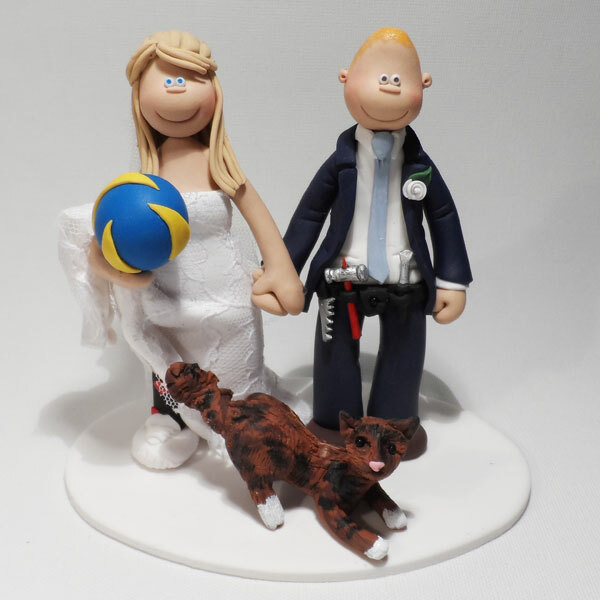 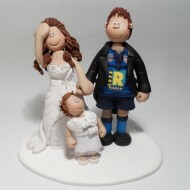 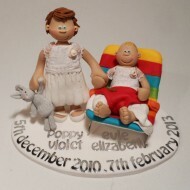 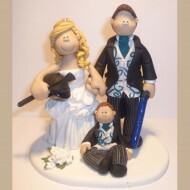 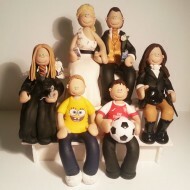 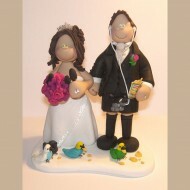 Our Olympic Cake Topper for Laura Trott & Jason Kenny! 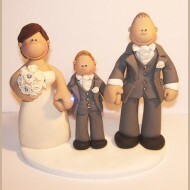 2 brothers got their own topper on their parent’s big day! We really liked the vibrant orange theme in this topper! 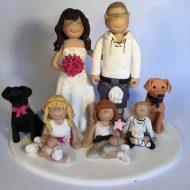 A large family featuring a young boy, 2 cats and 2 dogs! 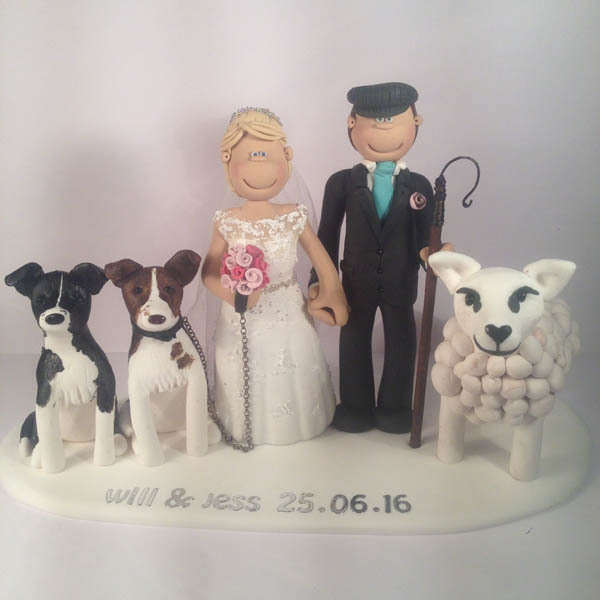 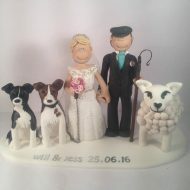 A farmer with his bride, dogs and even a sheep! 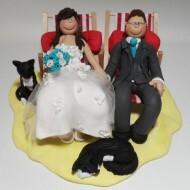 This couple’s dog had to be part of the wedding! 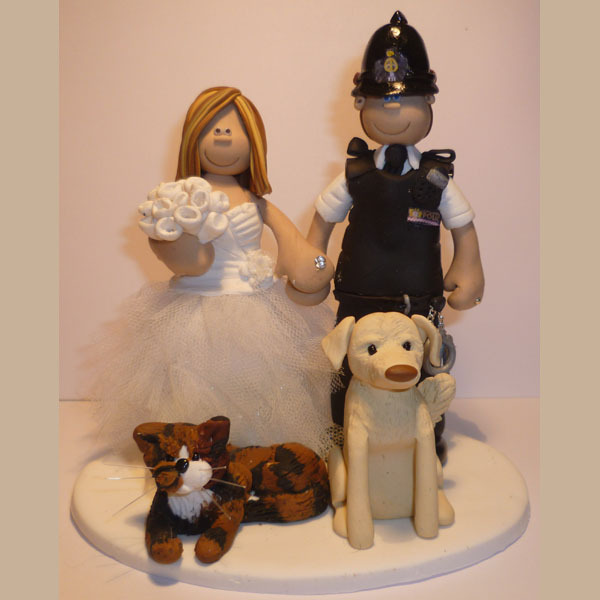 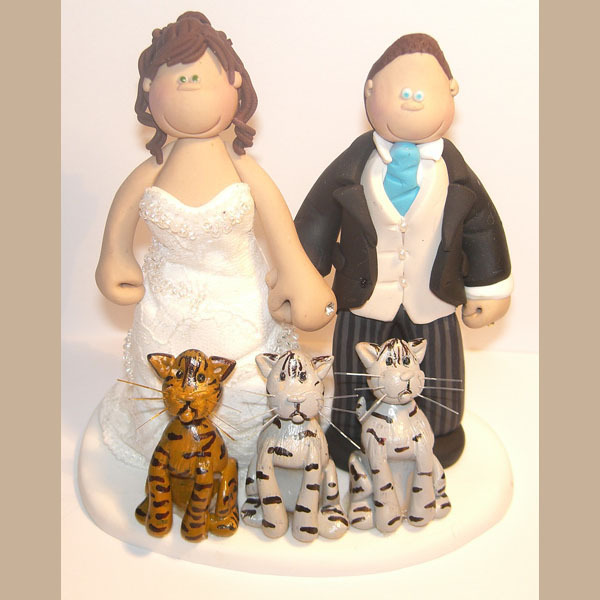 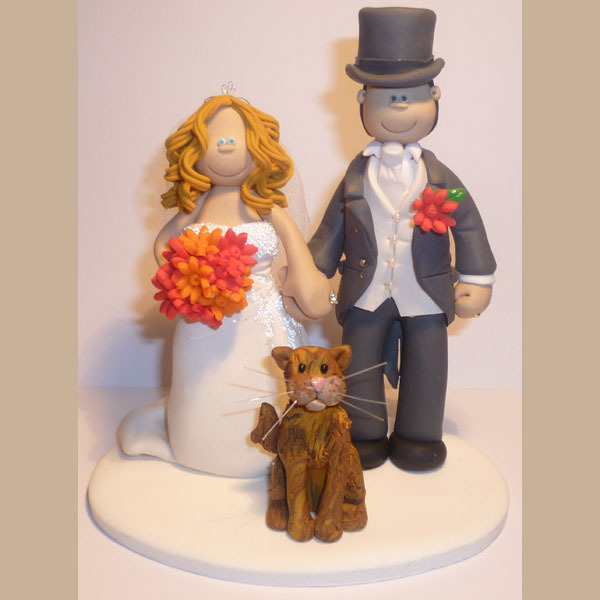 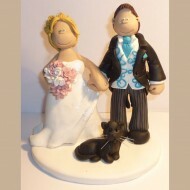 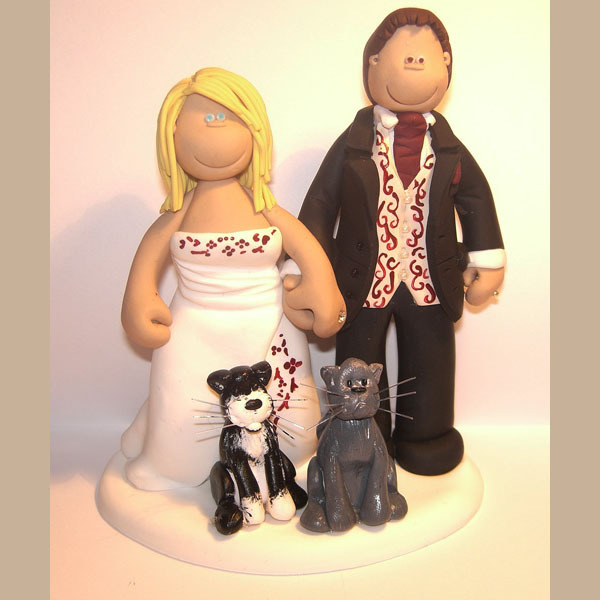 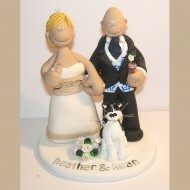 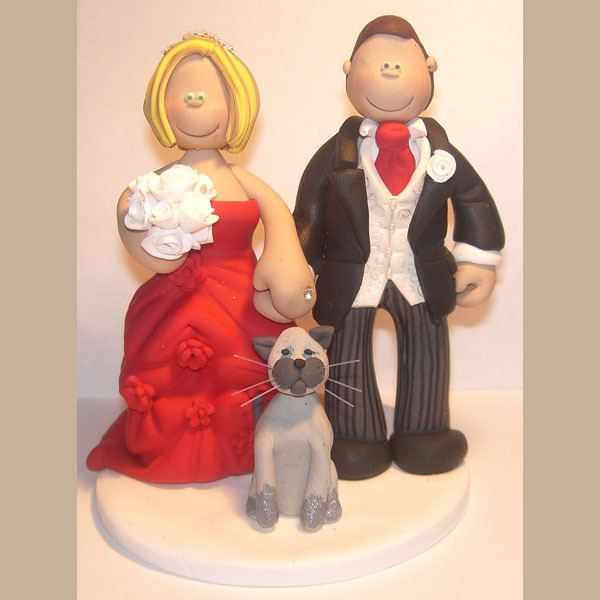 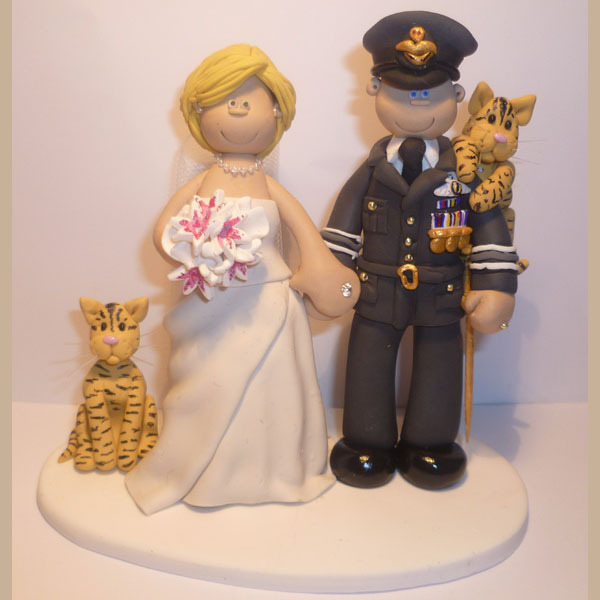 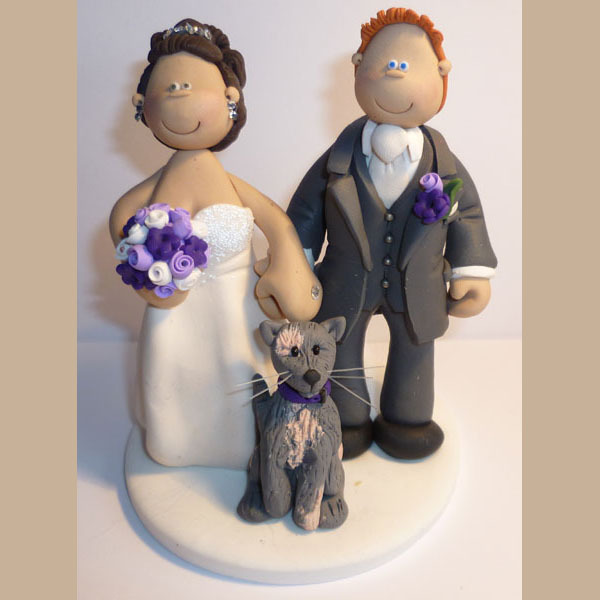 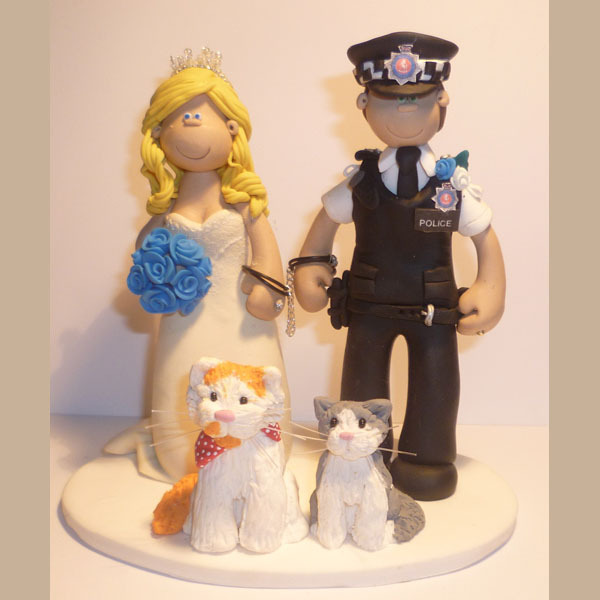 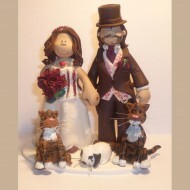 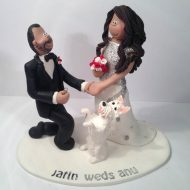 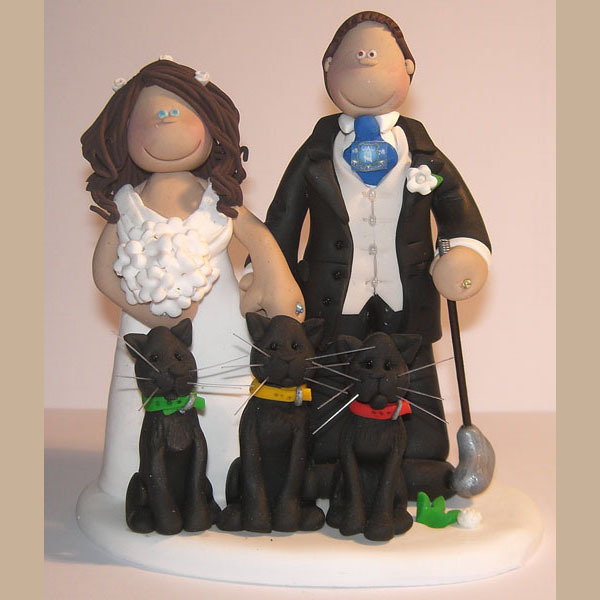 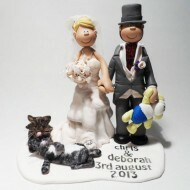 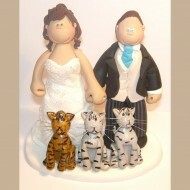 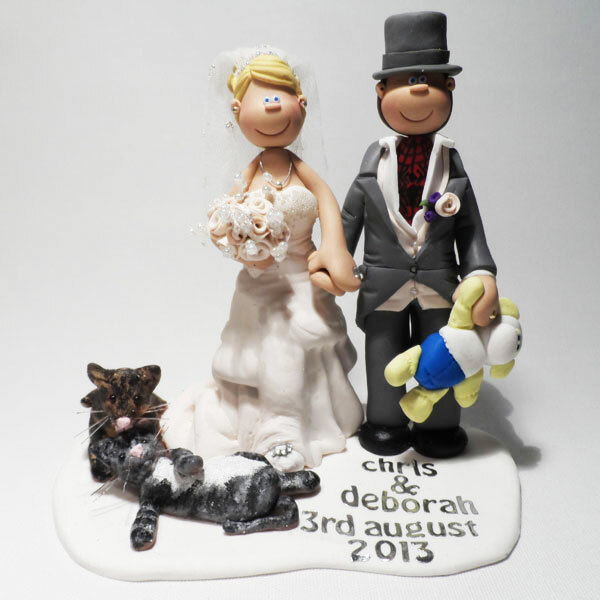 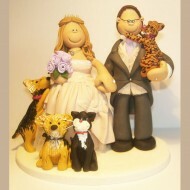 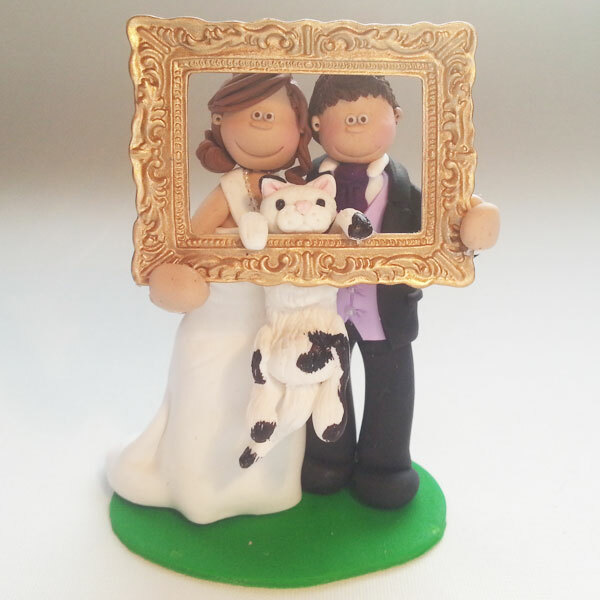 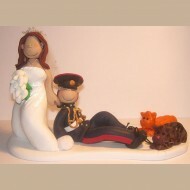 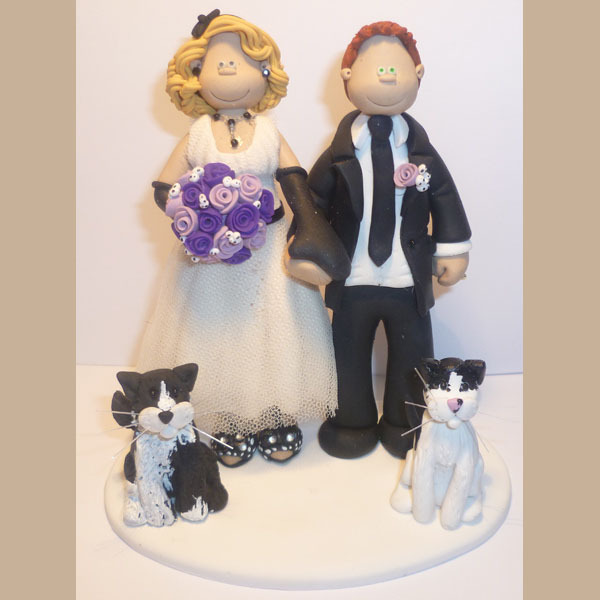 The ginger cat stands out in this wedding cake topper! 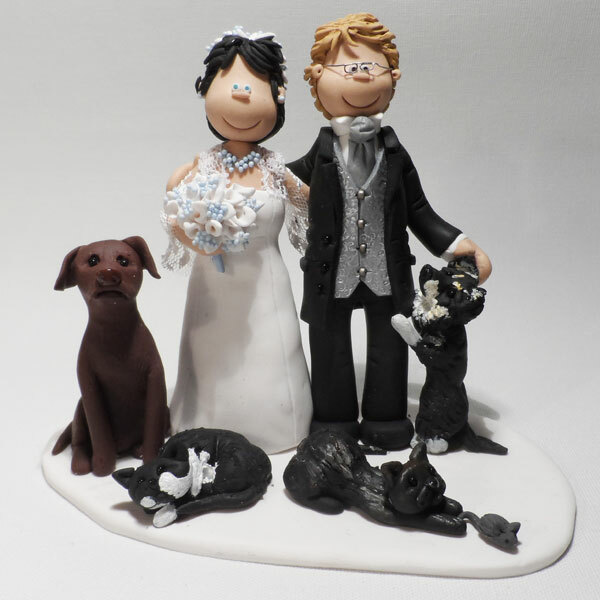 This couple invited their 3 cats and dog to their wedding! 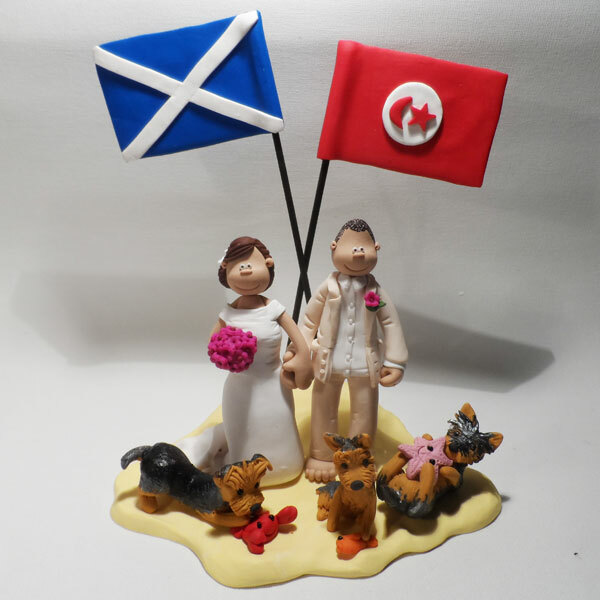 A Scottish & Tunisian couple and their dogs playing in sand. How cute are these 3 pets together! 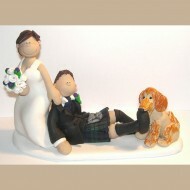 The dog is a Cavachon. 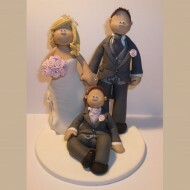 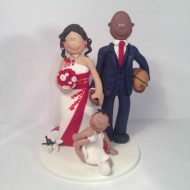 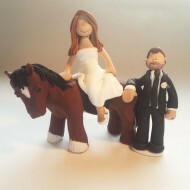 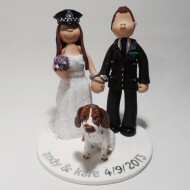 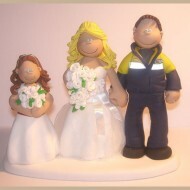 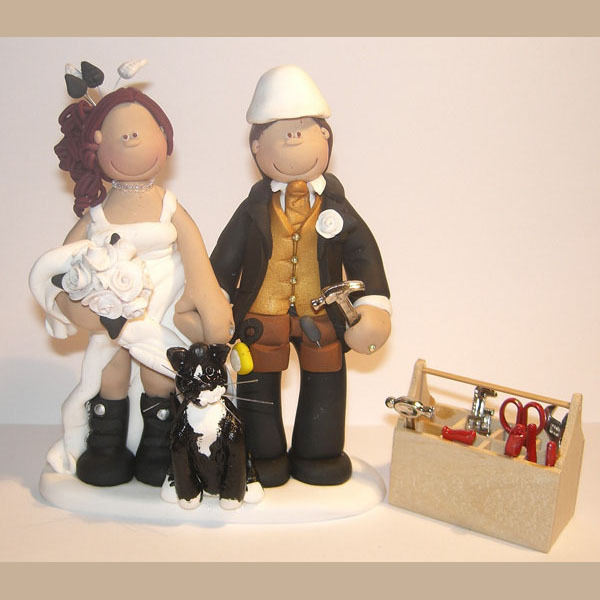 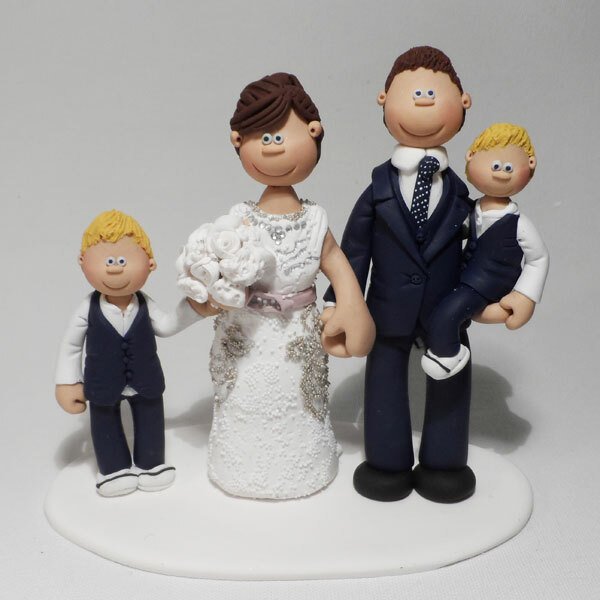 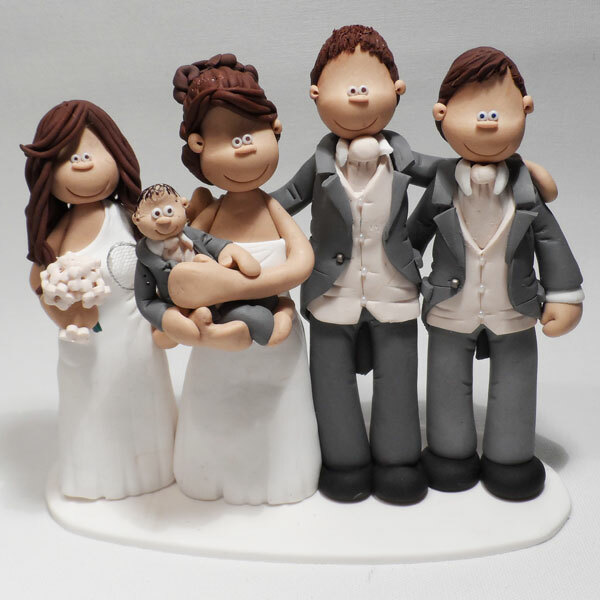 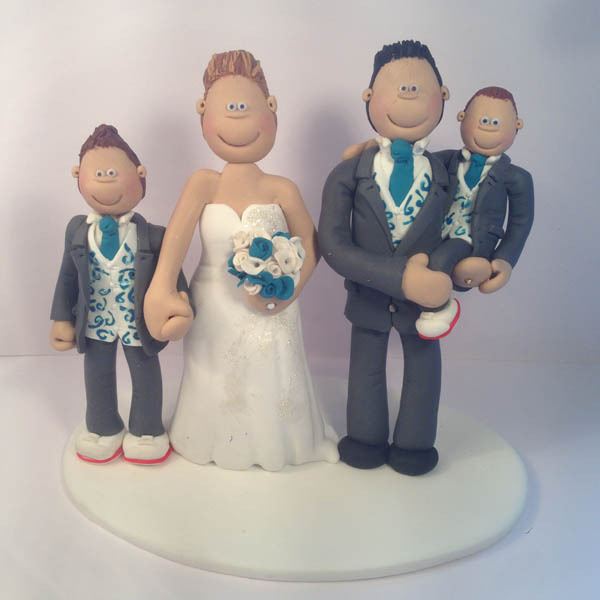 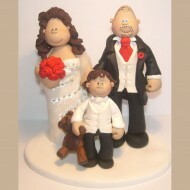 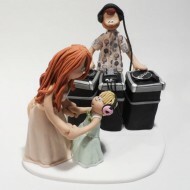 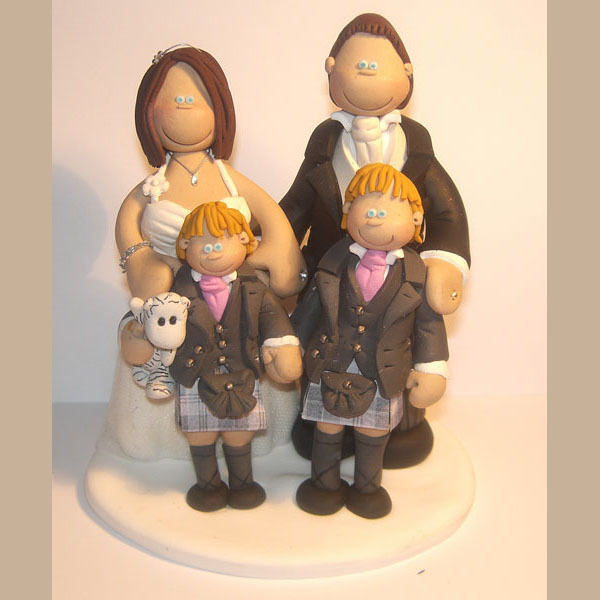 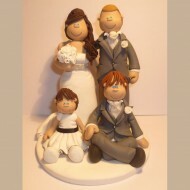 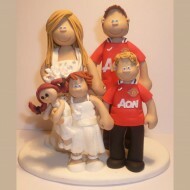 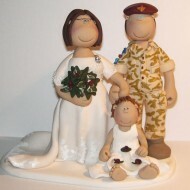 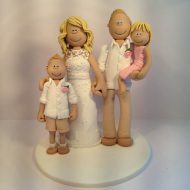 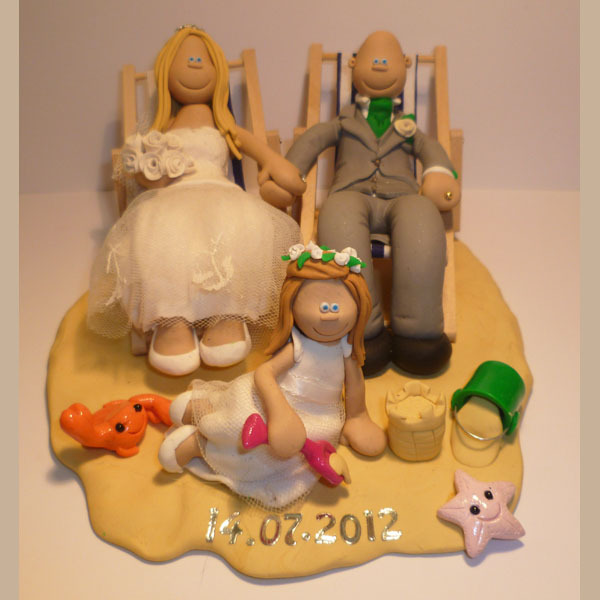 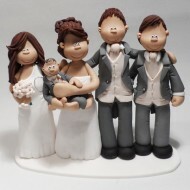 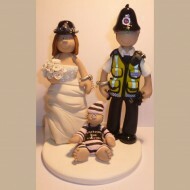 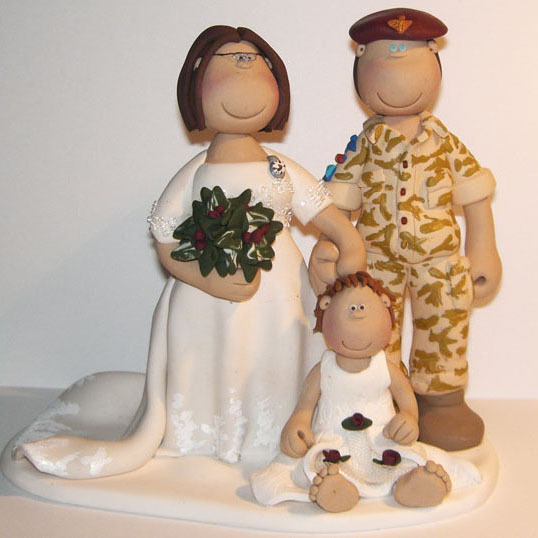 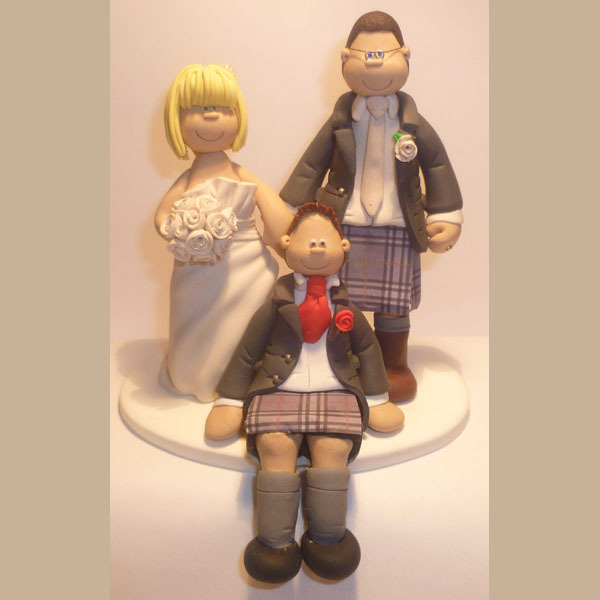 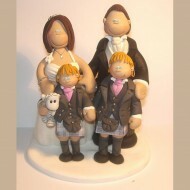 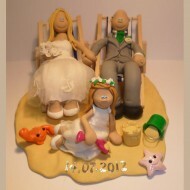 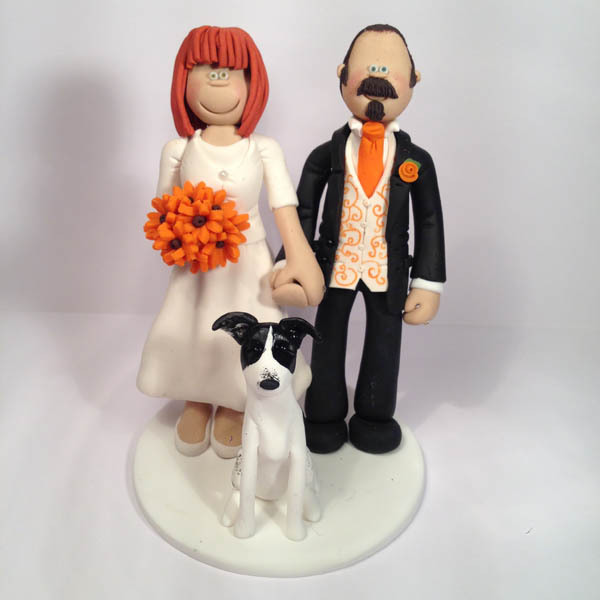 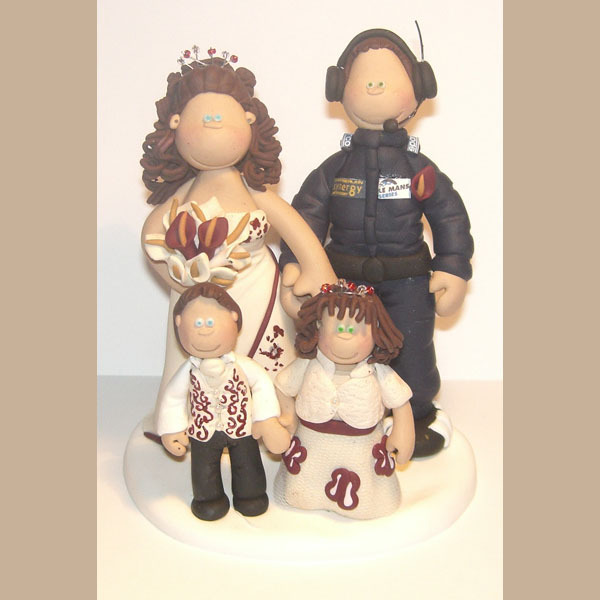 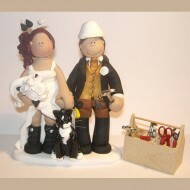 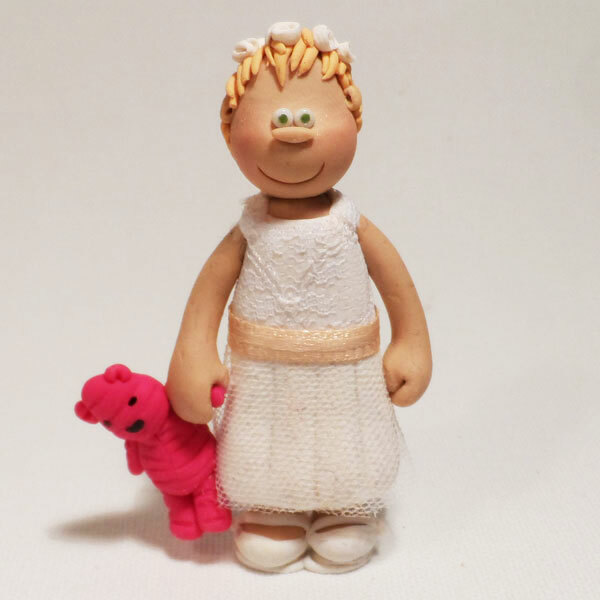 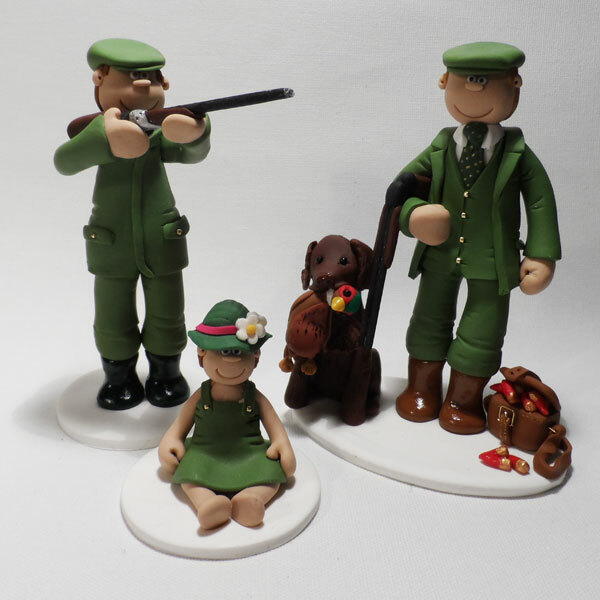 One of the cutest family wedding cake toppers we’ve made! 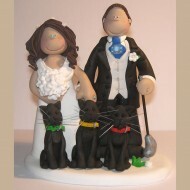 A spiderman groom with his bride and their 2 cats! 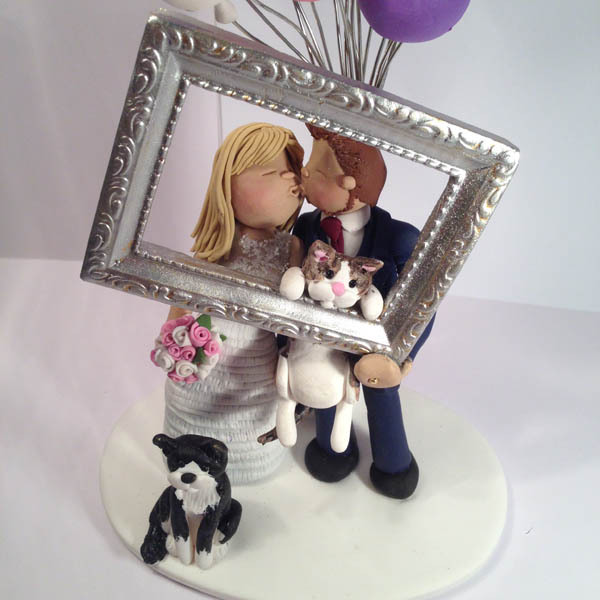 A cute cake topper of a child holding her favourite toy! 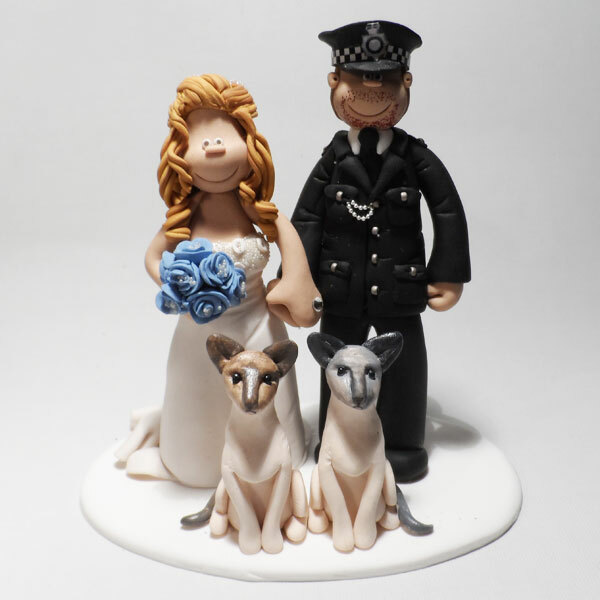 This bride is in trouble for stealing her groom’s police hat! 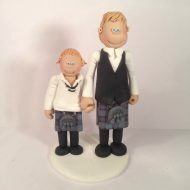 2 children matching their dad’s outfit, including the kilt! 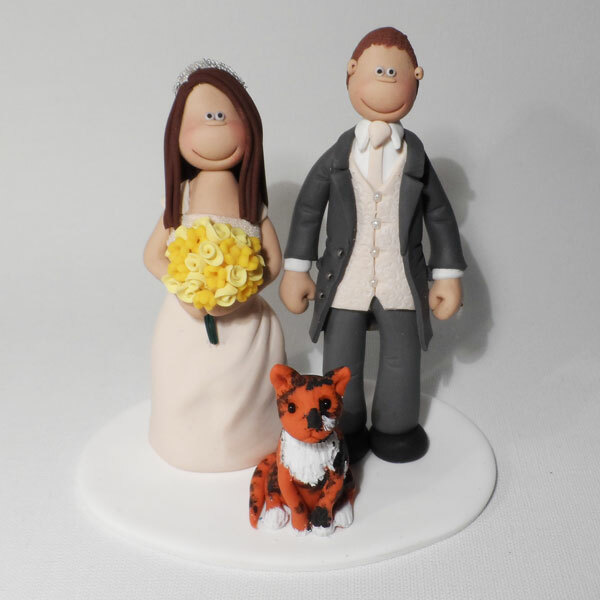 A topper with one of the most unique dogs we’ve made! A unique topper featuring birds, an iPod and crisps! A scottish couple with their 2 cats, one of which is sleepy! 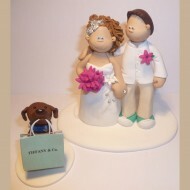 A trusting couple leaving their dog to carry the Tiffany rings! 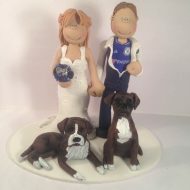 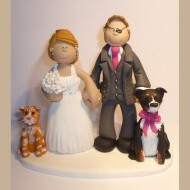 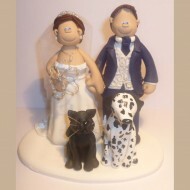 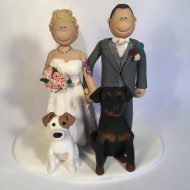 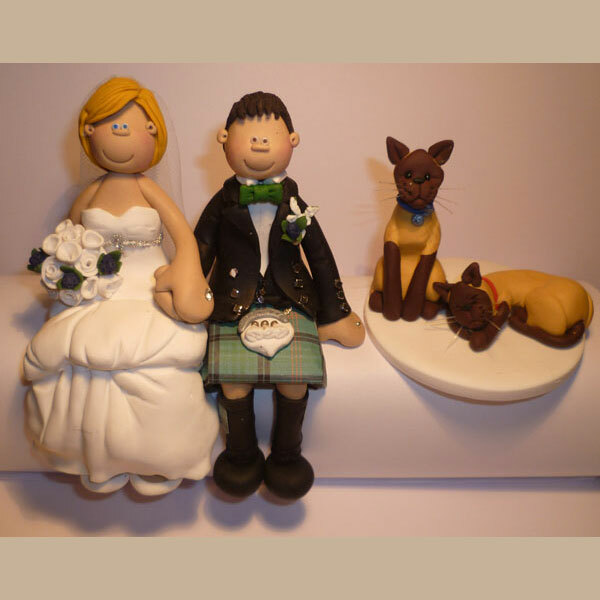 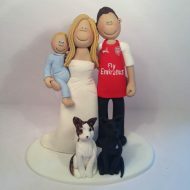 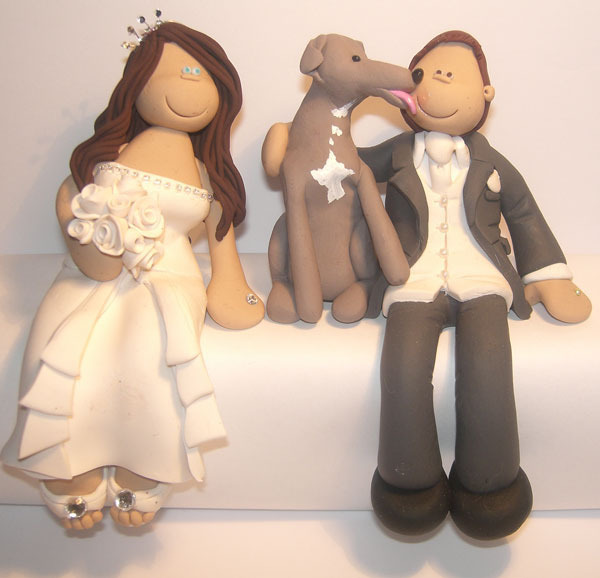 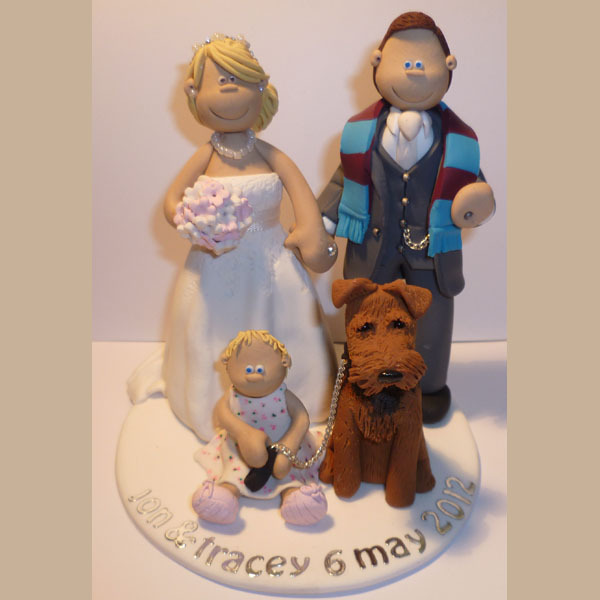 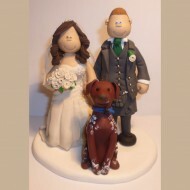 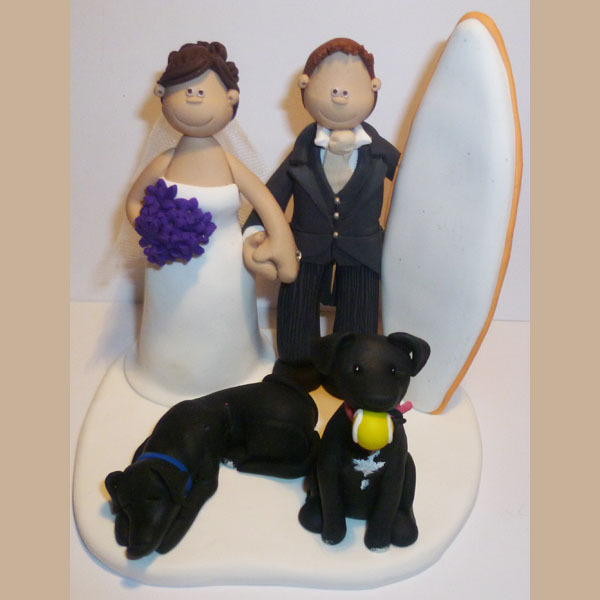 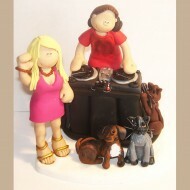 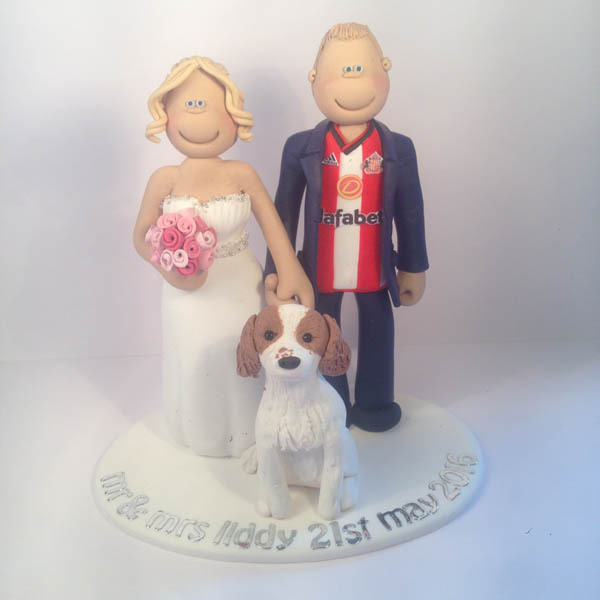 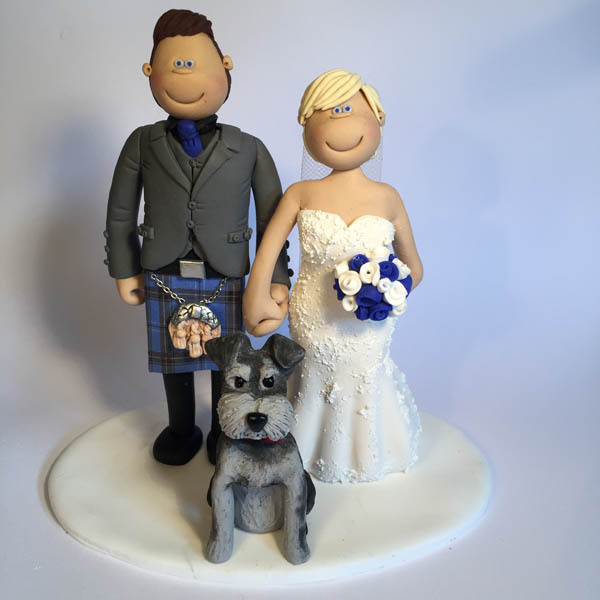 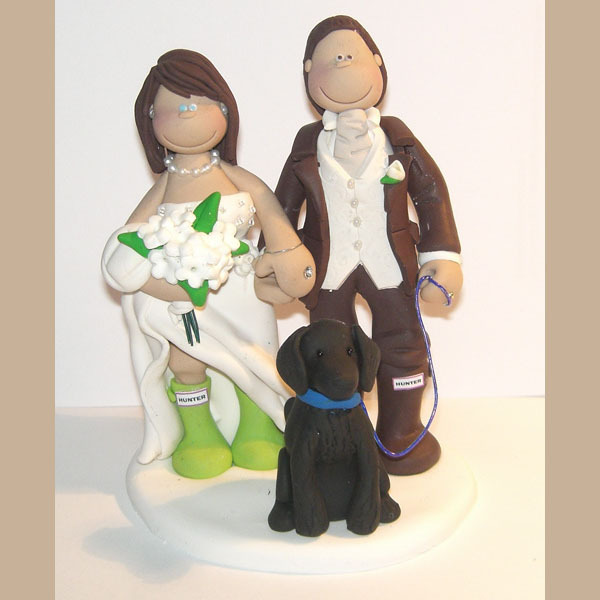 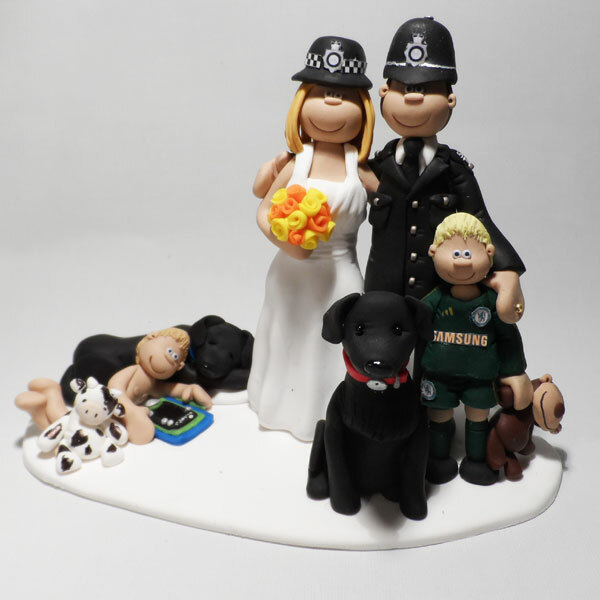 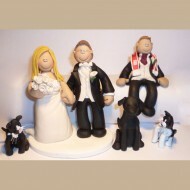 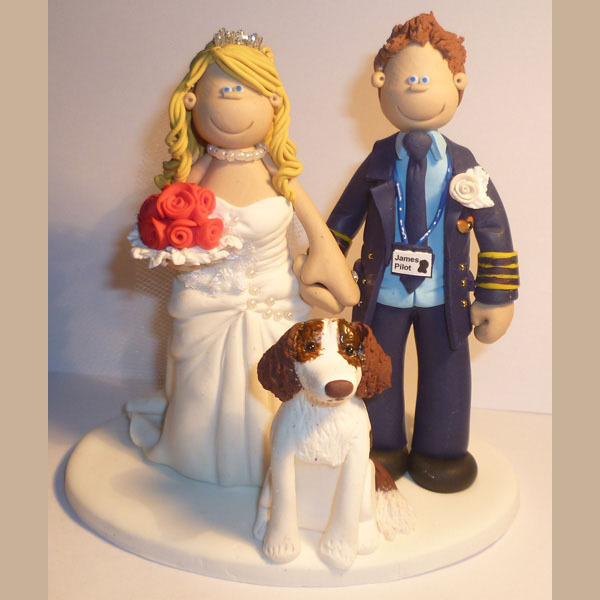 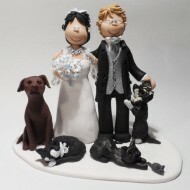 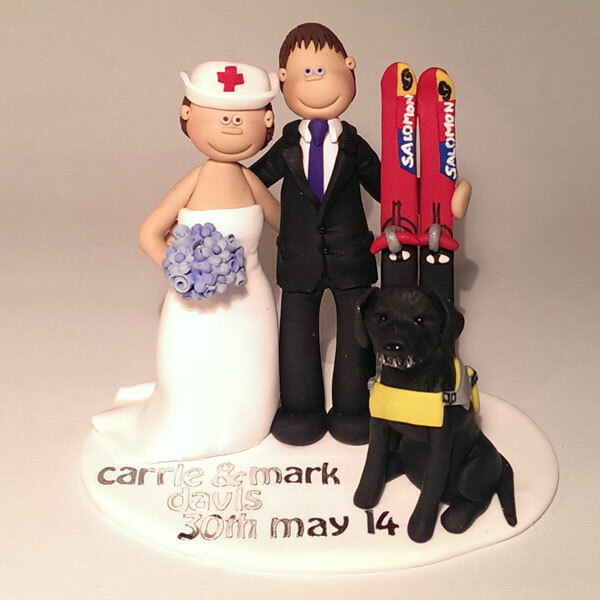 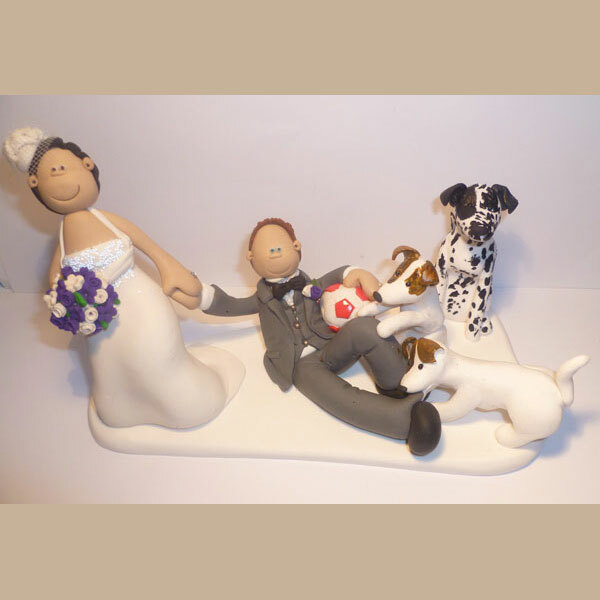 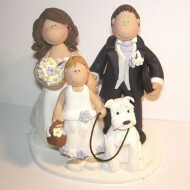 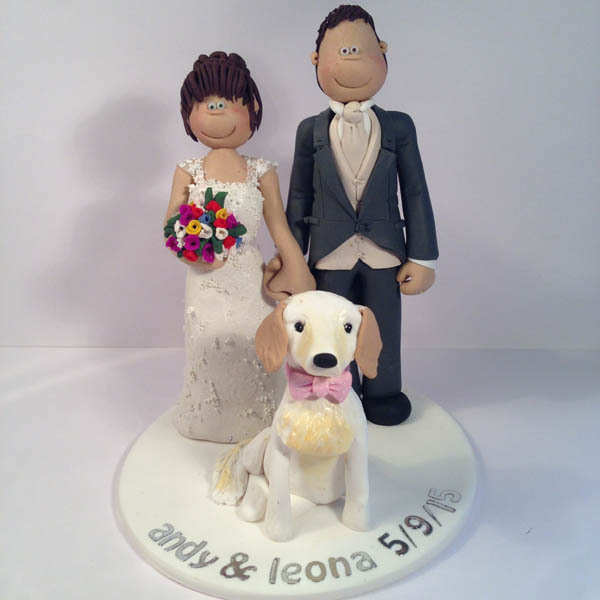 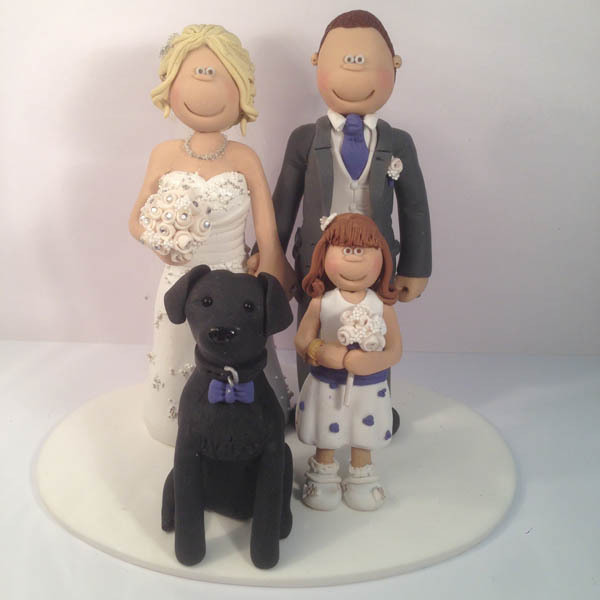 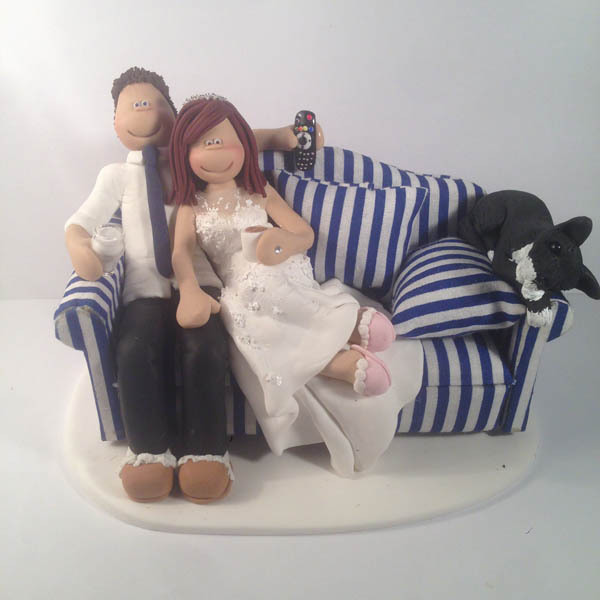 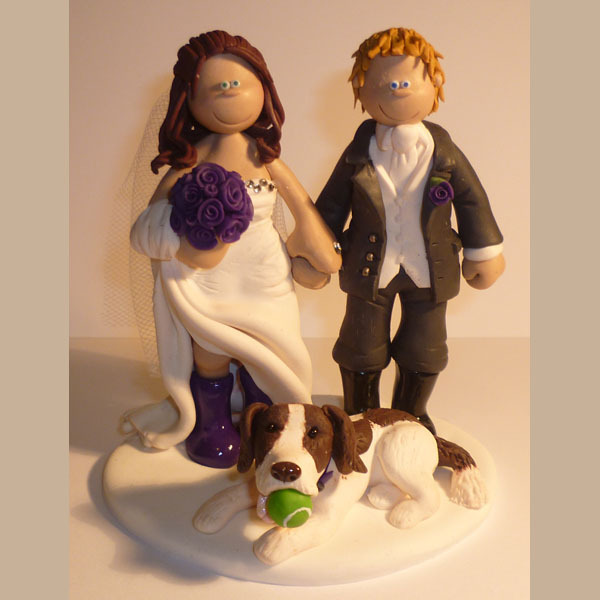 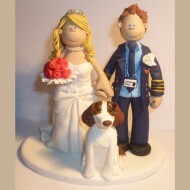 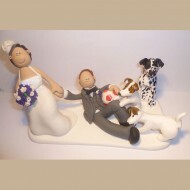 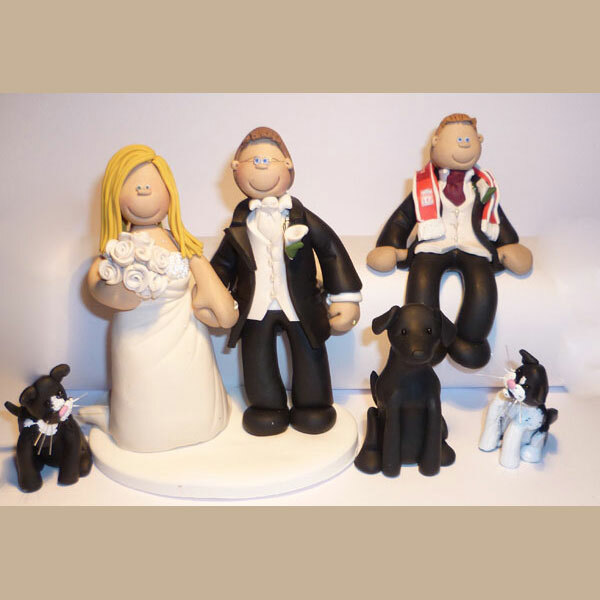 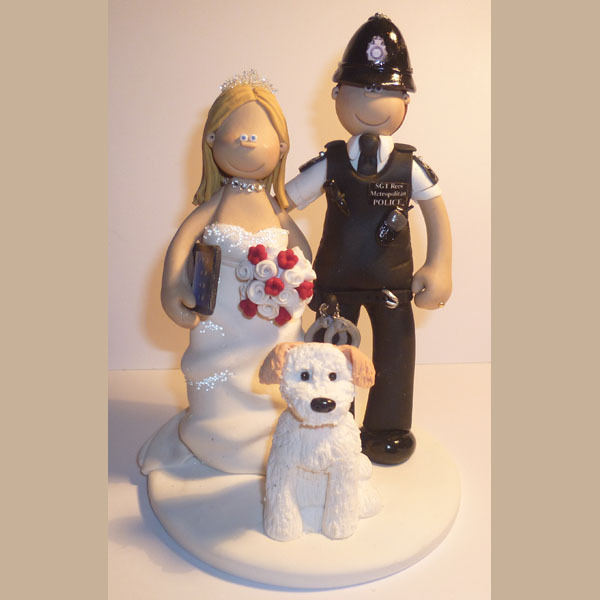 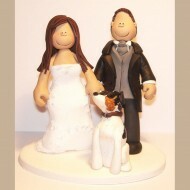 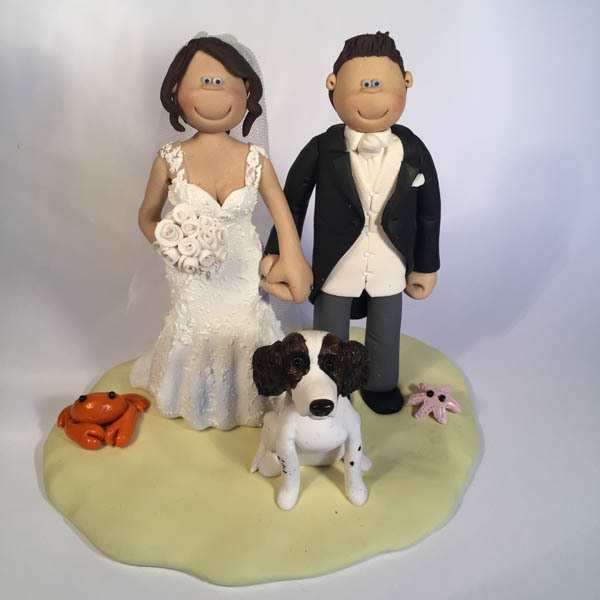 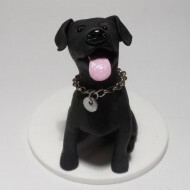 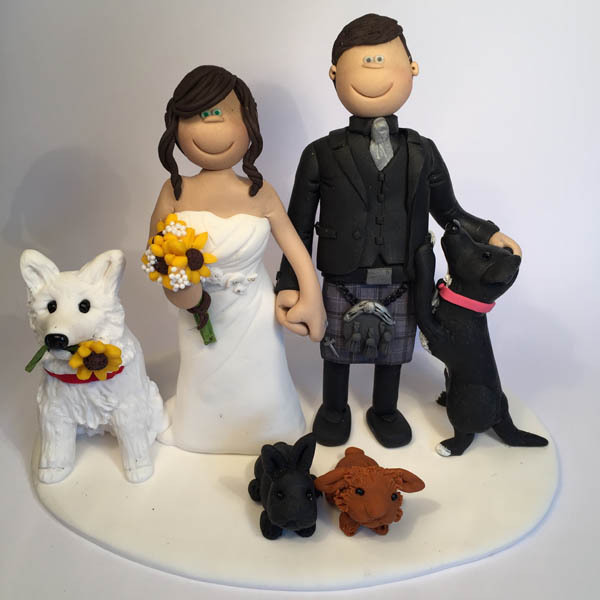 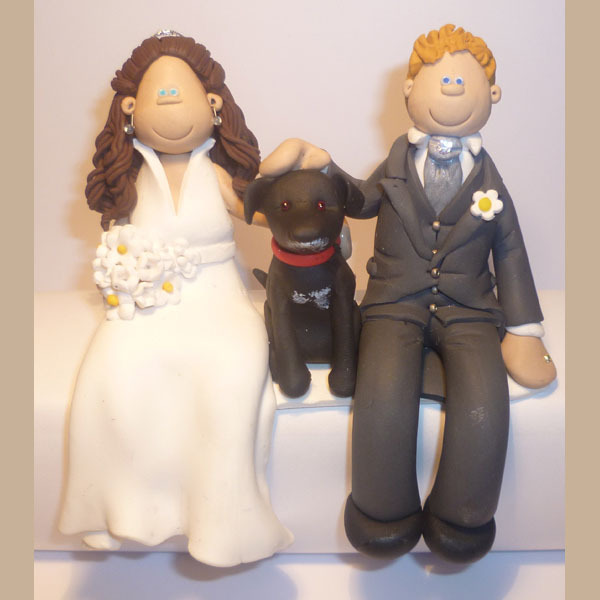 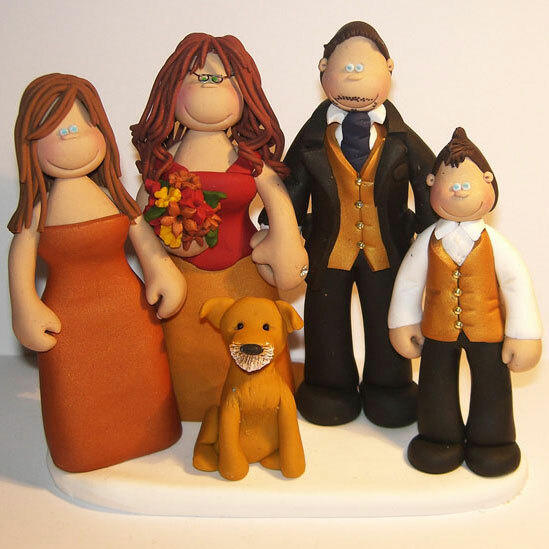 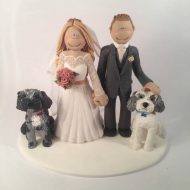 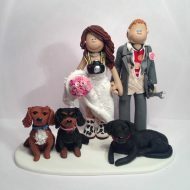 The dog in this cake topper clearly didn’t want to be left out! 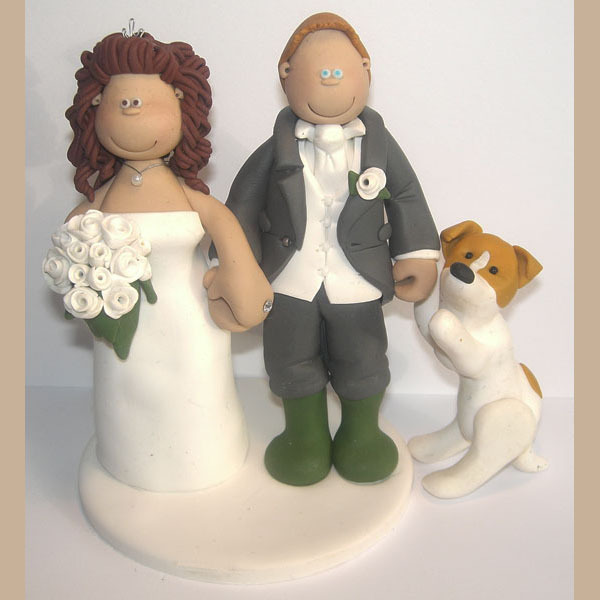 Presumably, this bride & groom walk their dog in muddy fields! 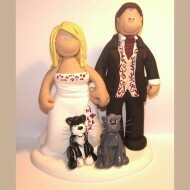 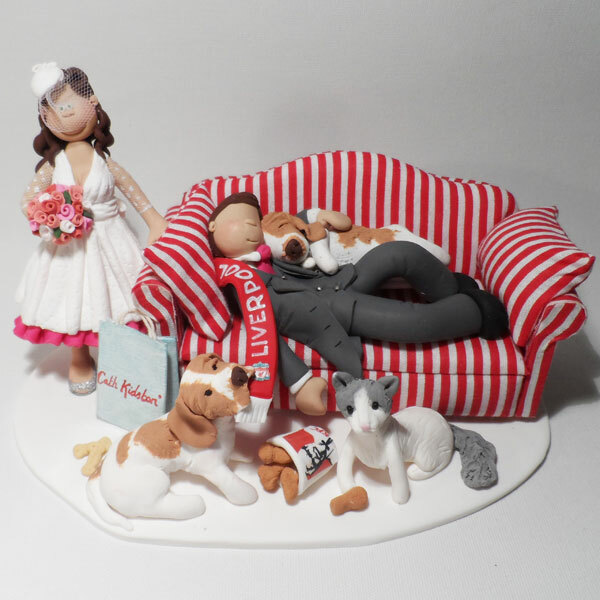 Even the cat in this cake topper matches the groom’s outfit! 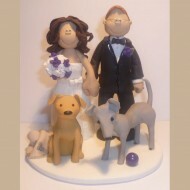 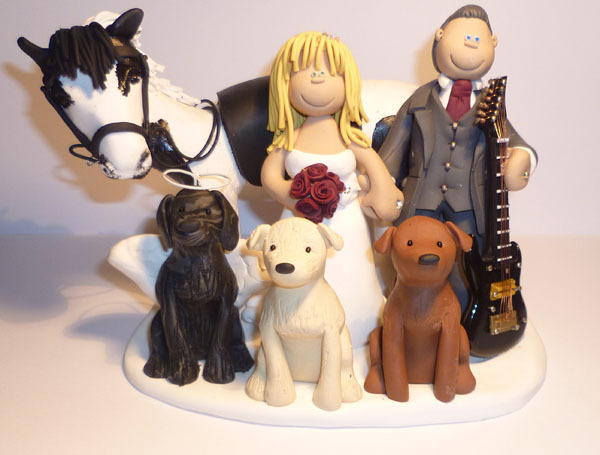 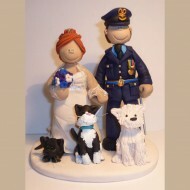 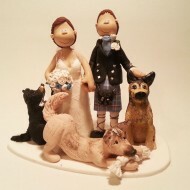 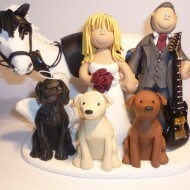 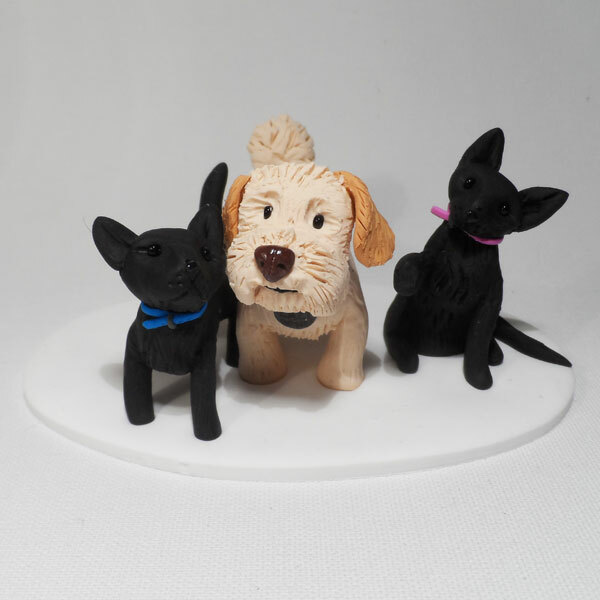 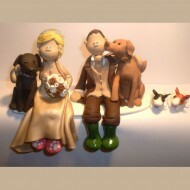 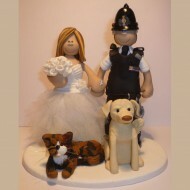 A wedding cake topper where the pets are the stars! 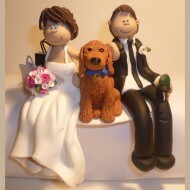 This dog’s owners made sure he was part of their big day! 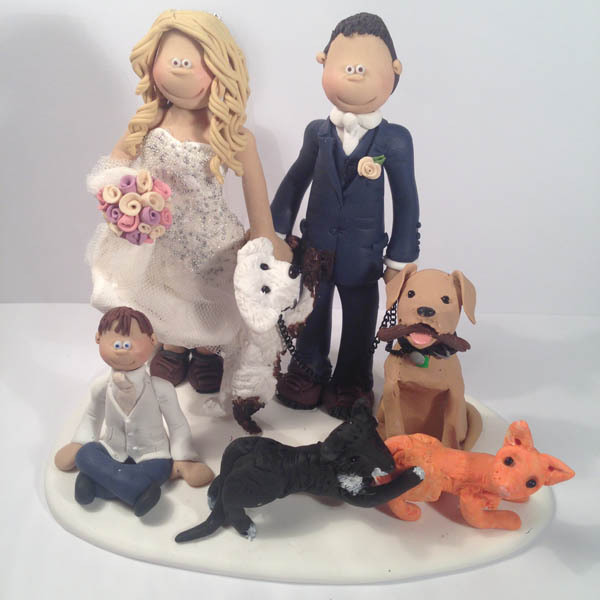 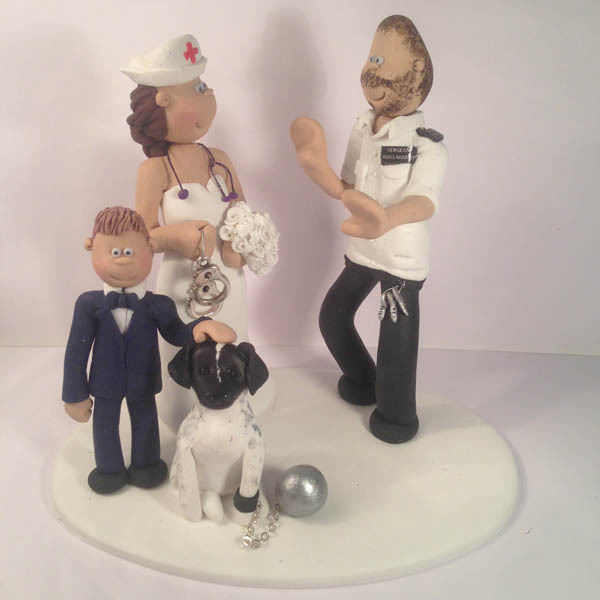 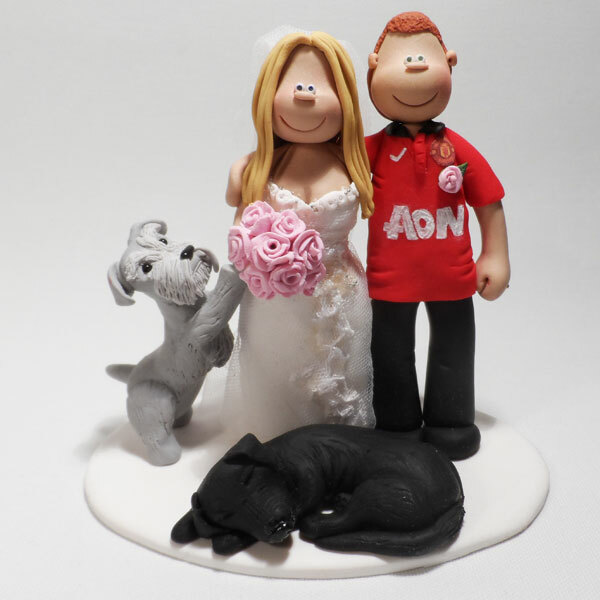 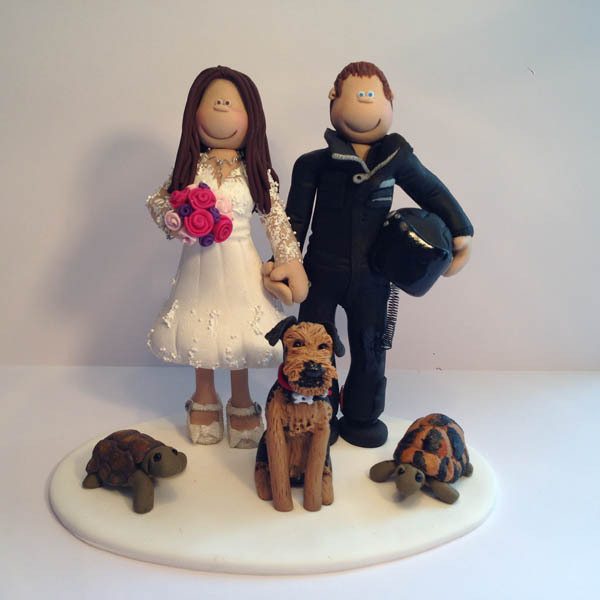 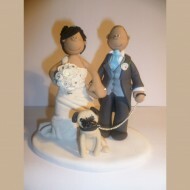 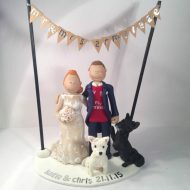 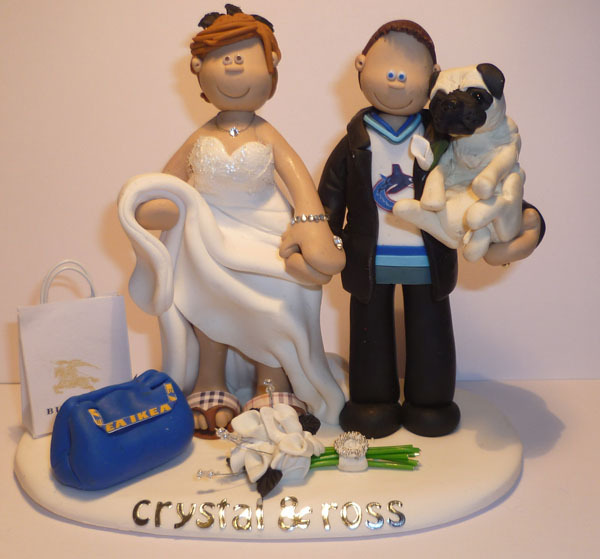 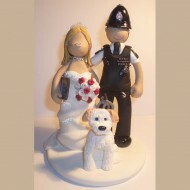 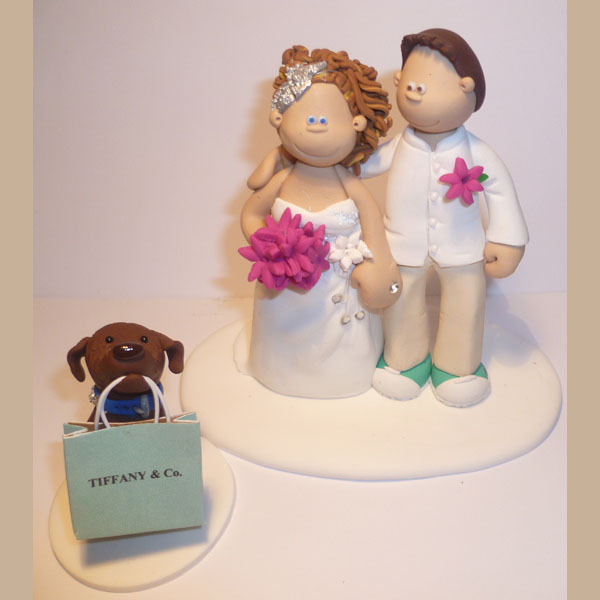 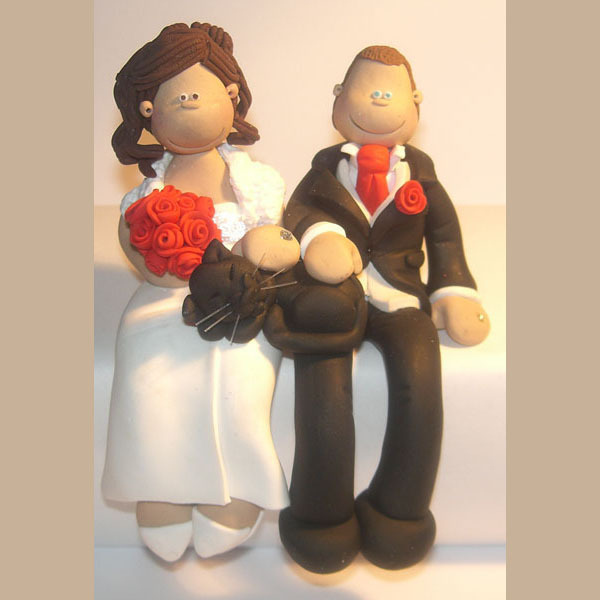 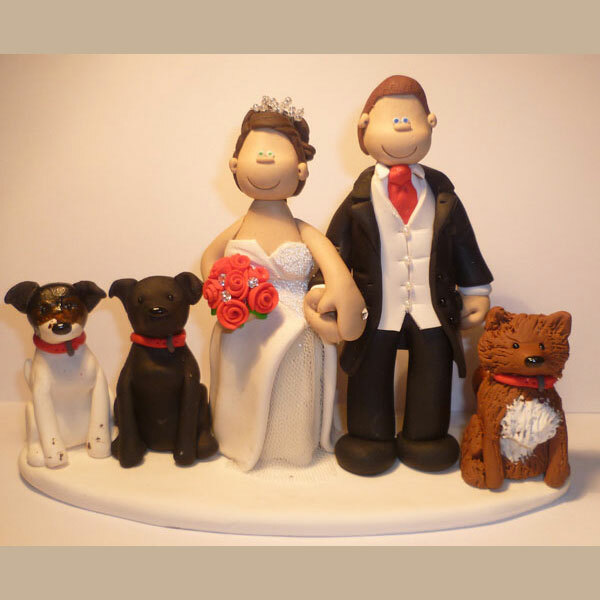 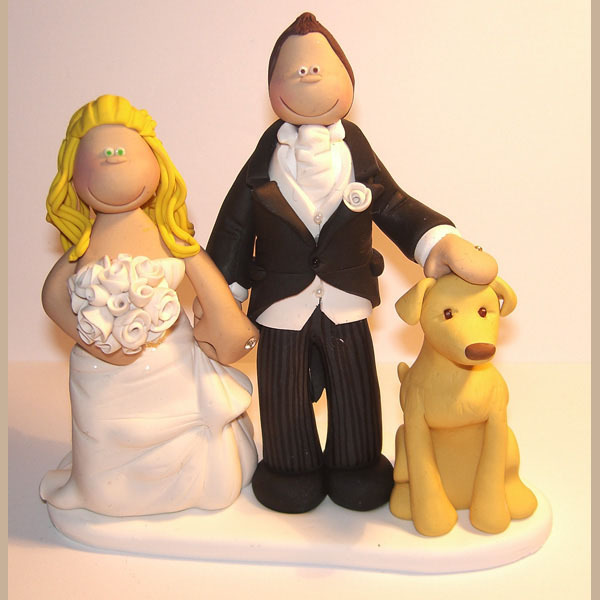 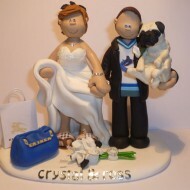 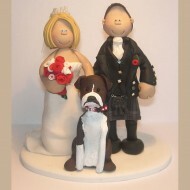 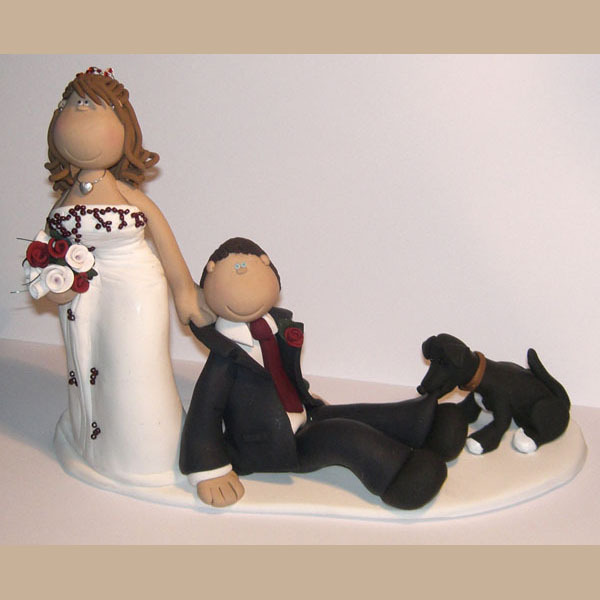 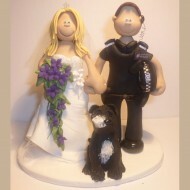 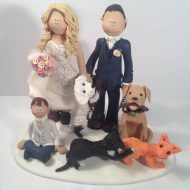 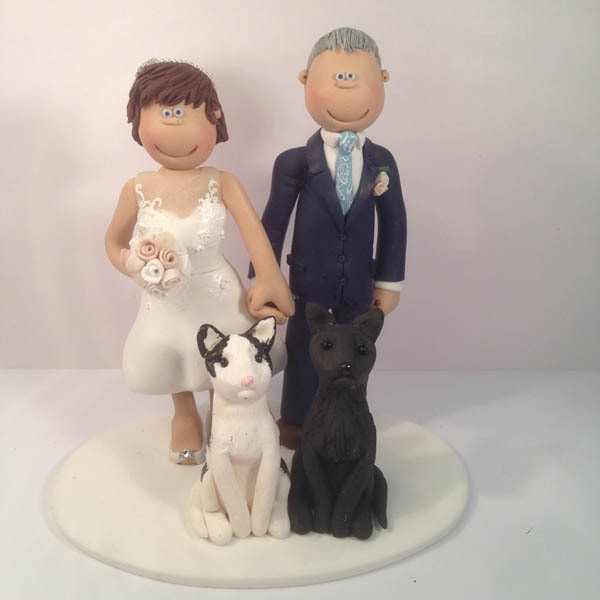 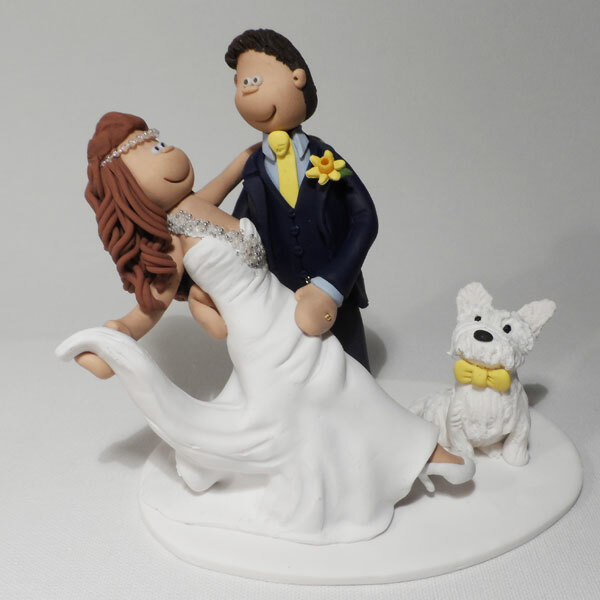 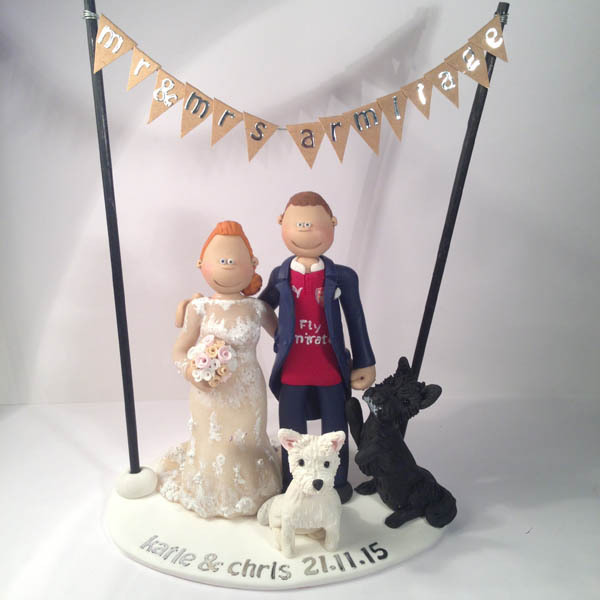 This cake topper features a couple with their pet Pug! 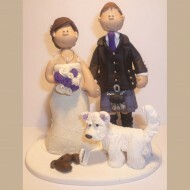 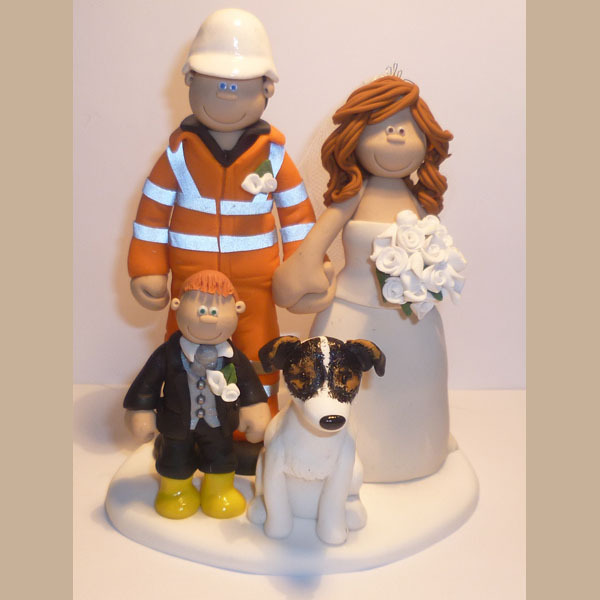 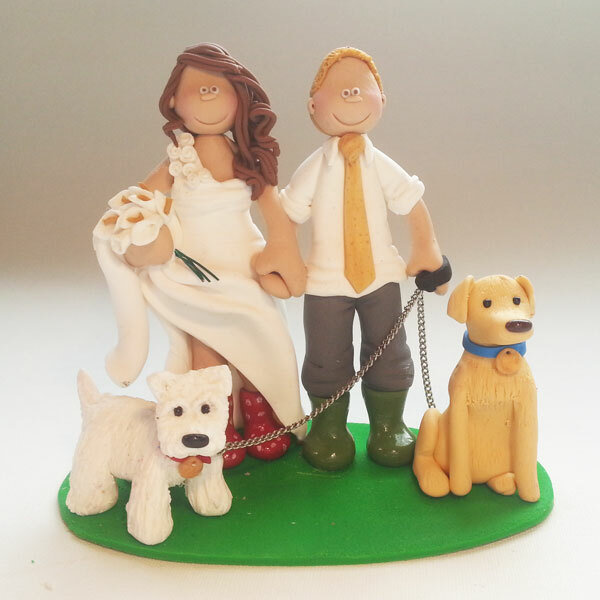 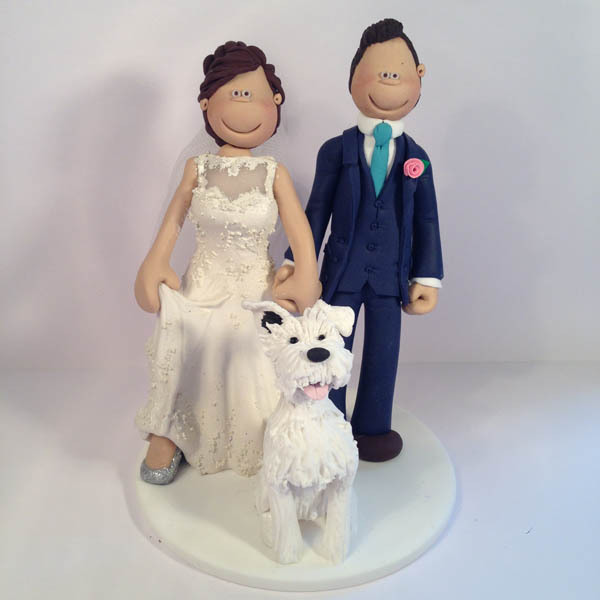 A bride and groom with their pet Westie dog and a crab! 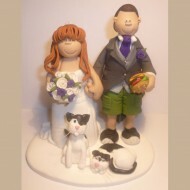 A groom wearing shorts whilst enjoying a hamburger! 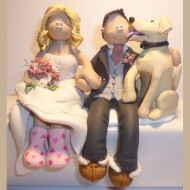 A bride in her wellies while her groom gets a kiss off their dog! The bride isn’t the only getting a kiss on her wedding day! 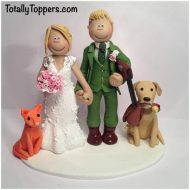 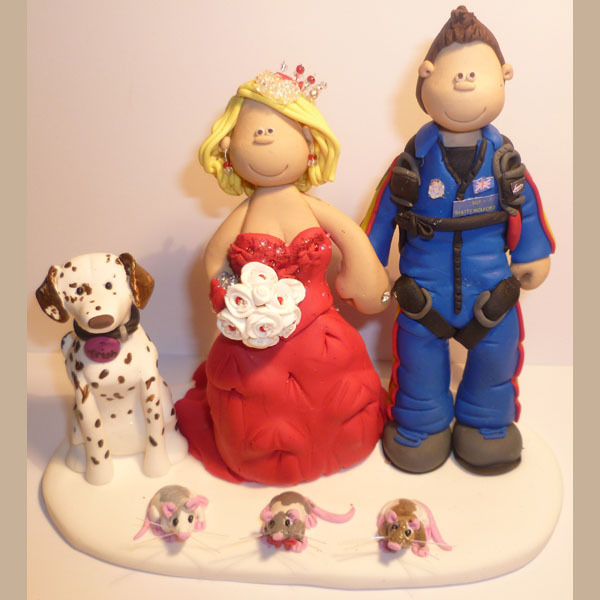 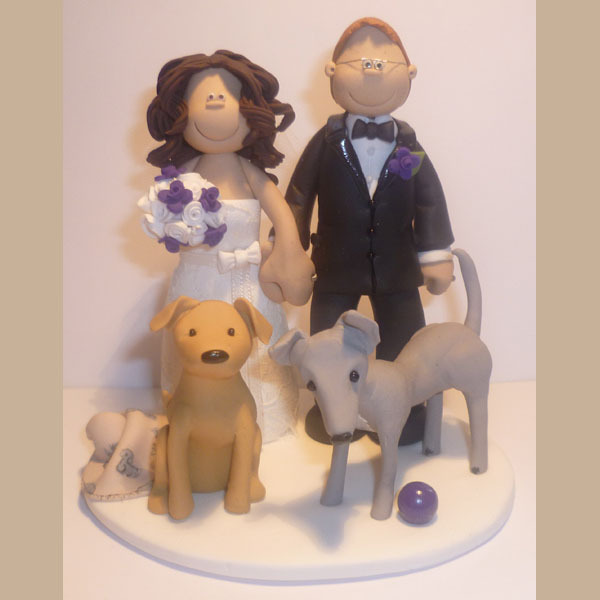 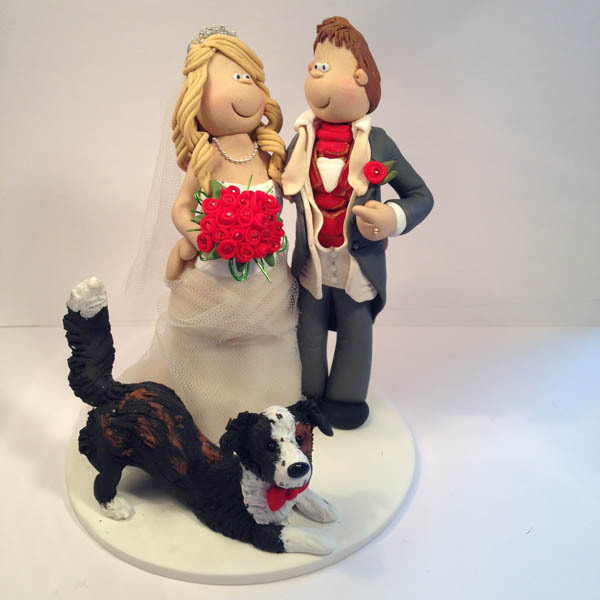 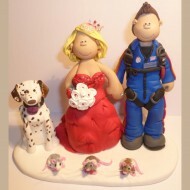 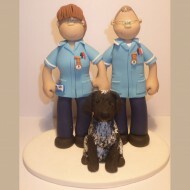 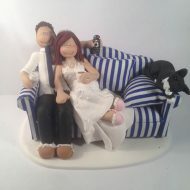 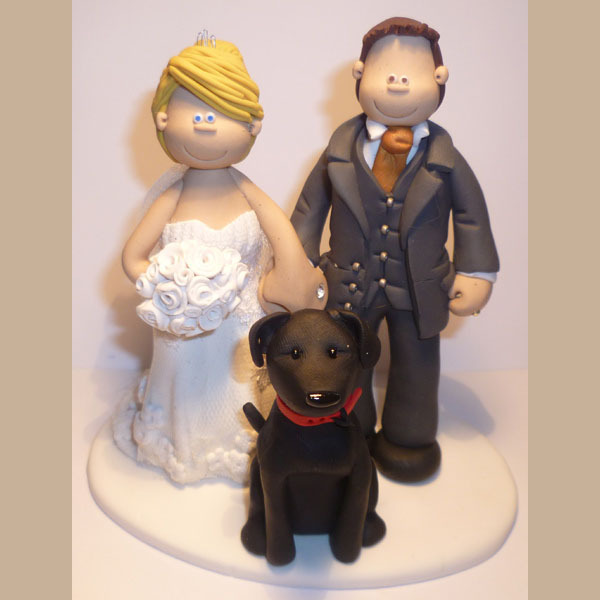 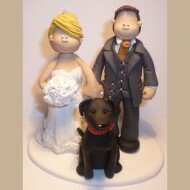 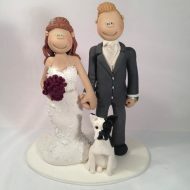 The dog in this cake topper is after some attention! 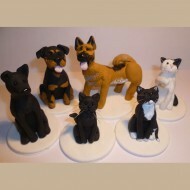 A complete collection of pets featuring 3 dogs and 3 cats! This bride got her dogs involved to get her groom to the church! 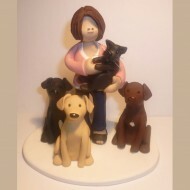 A single figure cake topper with all her pets together! A groom getting double teamed by his bride and dog! 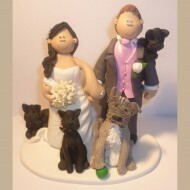 One of our more popular topper designs with added cats! The groom from this family worked for a racing team! 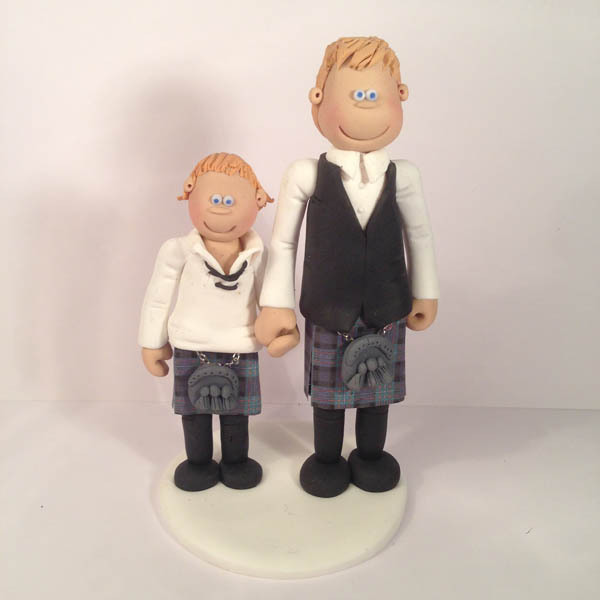 A groom in his work outfit with his son in his wellies!